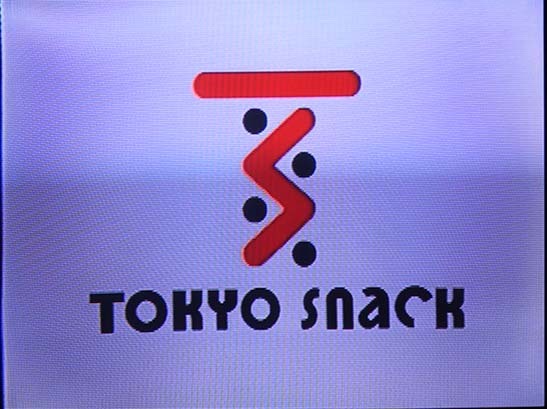 I was recently lucky enough to be able to acquire the VF-X2 Special Version (also known as the Tokyo Snack Version). Modified main page with the words "Special Version" added. 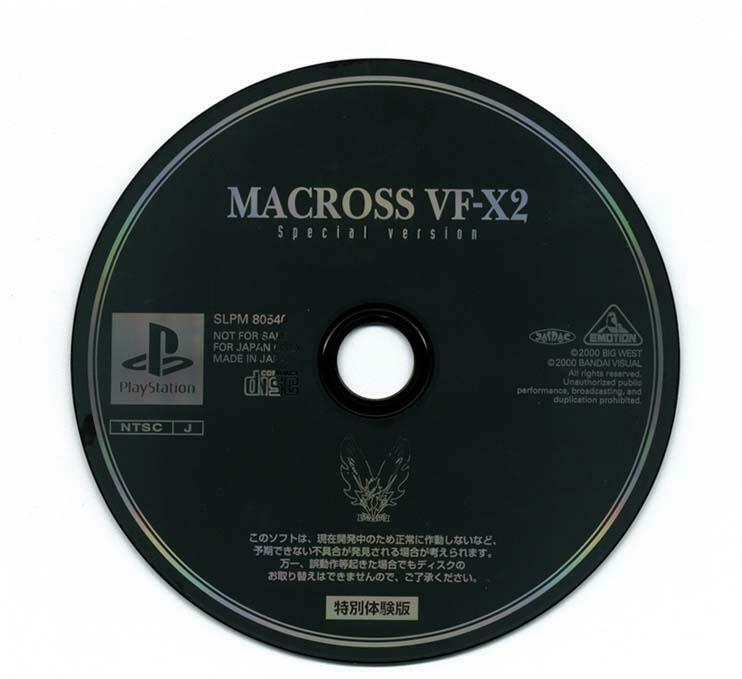 Game disk with black front featuring VF-X Ravens Logo and the words "Special Version"
Up until now, the only English language resource on VF-X2 Special Version has been Egan Loo's excellent Macross Compendium entry. 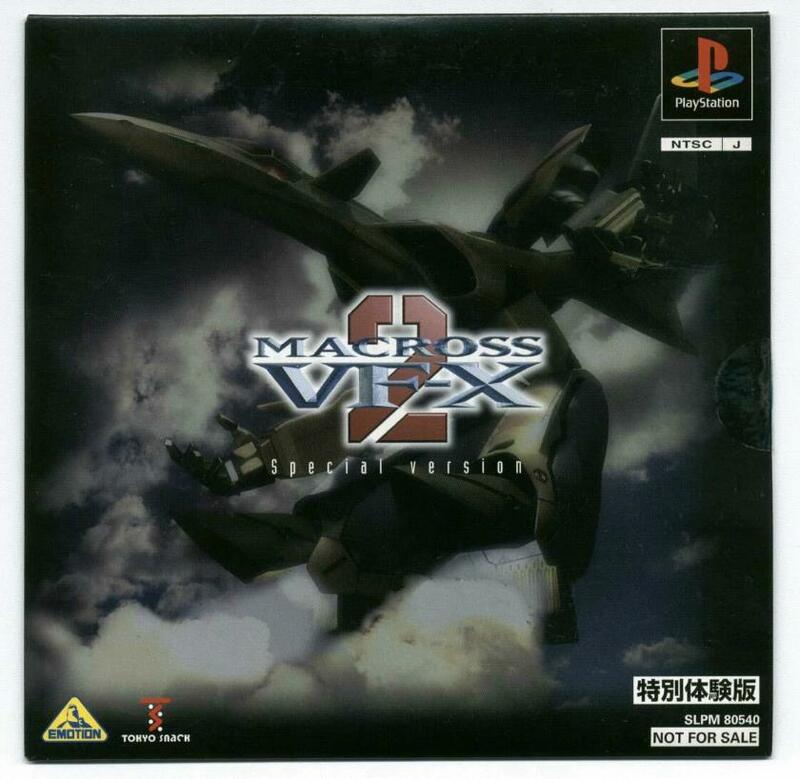 I now present you with a comprehensive look at one of the rarest of Macross games. VF-X2 Special Version comes in a card slip case instead of a regular plastic CD case. The cover art is different from the regular version, being the VF-19A GERWALK picture that was used in magazine advertisements for regular VF-X2. VF-X2 Special Version is supposed to come with 4 color postcards featuring CG art by Tenjin. Unfortunately, the version I obtained did not feature these. 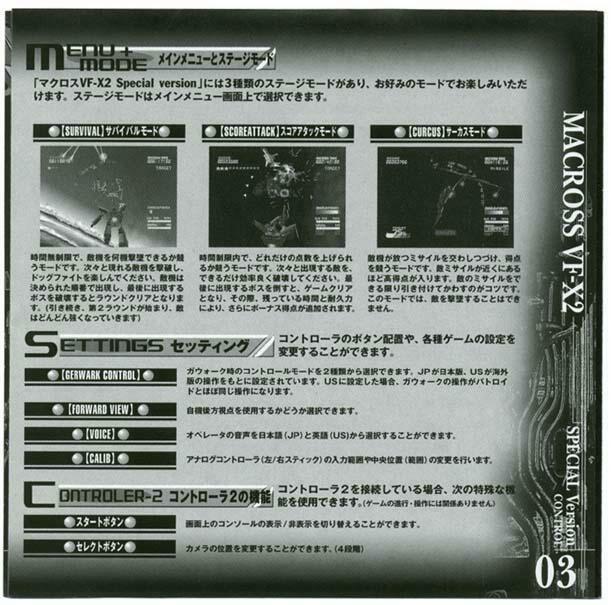 The instruction sheet of VF-X2 Special Version is also different from the regular instruction sheet as shown below. 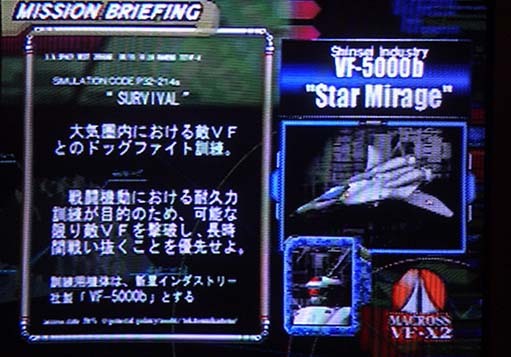 As far as the game itself goes, the most obvious change is that the player has only the use of the VF-5000B Star Mirage, which was not featured in the regular version. 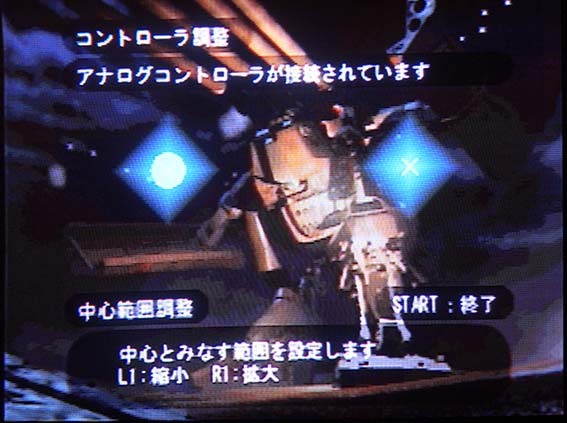 None of the regular mecha used in the standard VF-X2 game are available to the player of the Special Version. 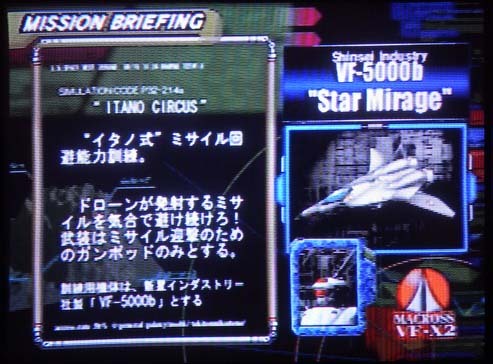 It is interesting to note that the VF-5000B was planned as a replacement for the VF-1XPlus in the now cancelled US version. 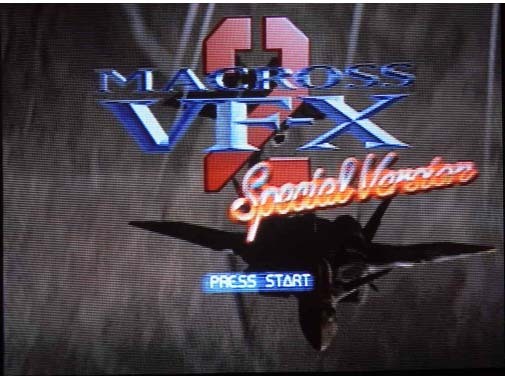 In fact according to the Macross Compendium, many of the features in VF-X2 Special Version were destined to end up in the US version. 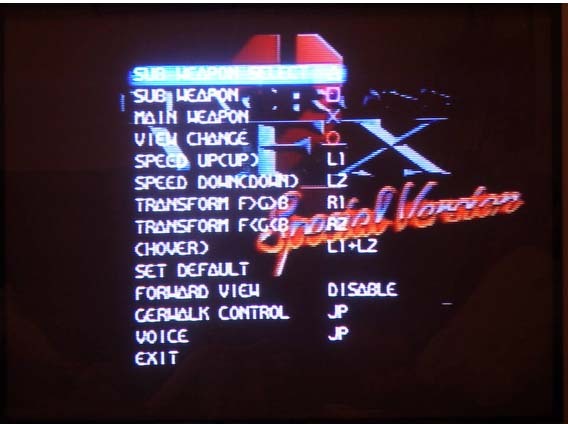 VF-X2 Special Version features the same controls as the regular version. However, on the options page it is possible to select either US or Japanese operating controls for GERWALK mode. The Japanese GERWALK controls are identical to the standard version of VF-X2. The US GERWALK controls are supposed to work the same way as battroid controls, but to be honest I haven't noticed any difference whether I select US or Japanese GERWALK controls! The option screen also allows players to select either a female English speaking (American accented) voice or a female Japanese voice for the operator. However, as their is no opening movie or introduction and no spoken mission briefings the Special Version features very little speaking. 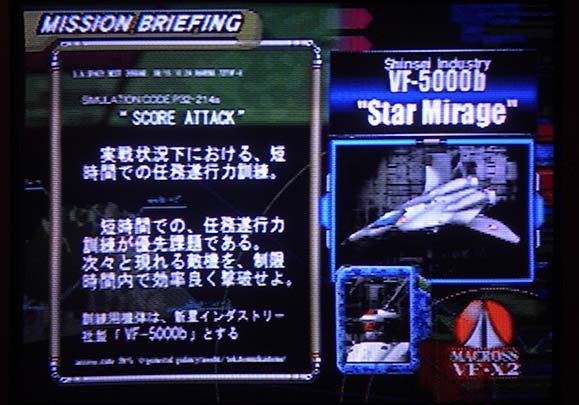 The only speech I have heard so far is warnings when your VF-5000B takes serious damage. Or warnings when the mission time is running out (Score Attack Mode only). "Captain Focker your armor is approaching critical, be careful" (39kb .wav file). 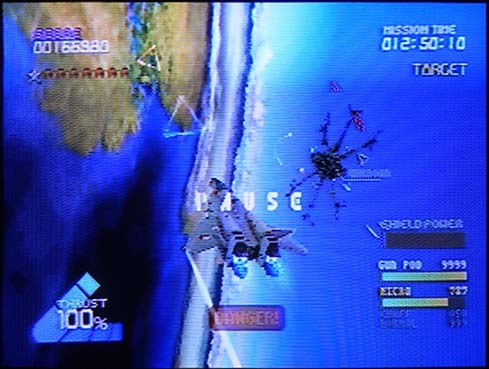 The game play of VF-X2 Special Version is similar to the regular retail version in that the player has to fly around and blow stuff up. 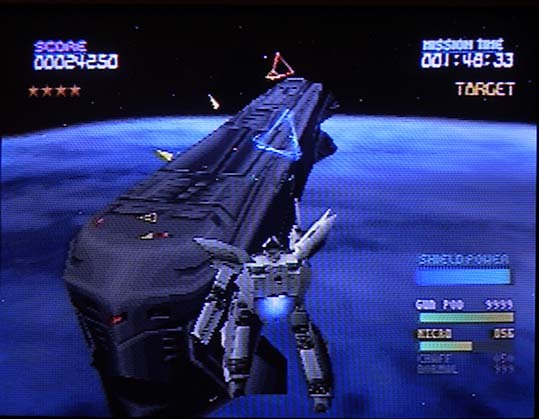 However VF-X2 Special Version does not feature the mission based stages of the original VF-X2 game. Instead, it has three distinct modes of play. 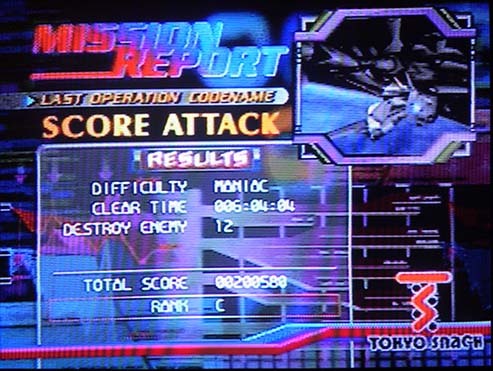 These are, 1) Score Attack Mode, 2) Survival Mode and, 3) Itano Circus Mode. 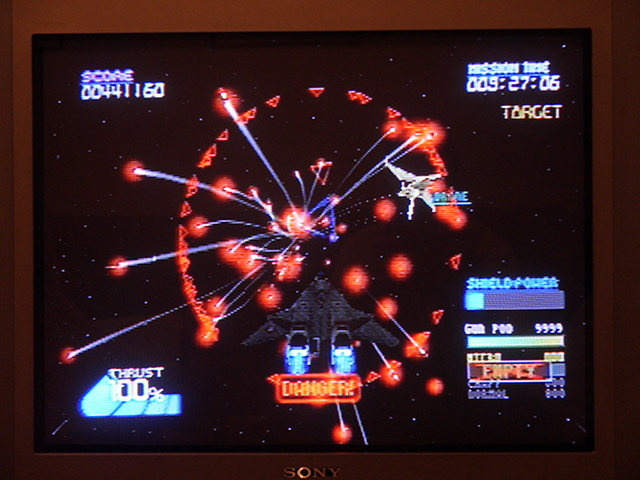 In Score Attack mode, the player has unlimited gunpod ammo and normal missiles, but only 100 Micro Missiles and 50 Chaff. 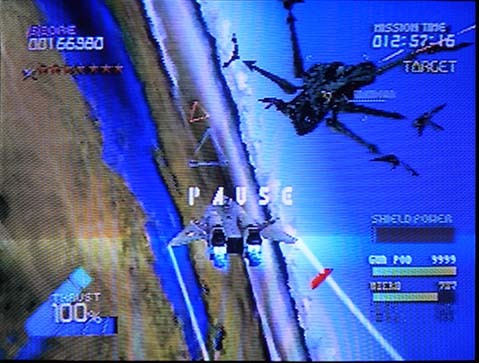 Survival mode finds the player flying above the landscape used in mission two of regular VF-X2. As the name implies, the aim of survival mode is to kill as many of the enemy before being killed yourself. To help you do this you are given an unlimited amount of gunpod ammo and normal missiles and 999 Micro-Missiles and 99 Chaff. Survival mode is split into rounds. During each round you will be attacked be about 12 to 18 enemy, although thankfully not all at once! The enemy usually attack in waves of between 1 to 3 craft. The final enemy of each round is always the Annabella Lasiodora Mobile Weapon from mission number 10 of the standard VF-X2. The exact quantity and mix of the enemy varies from round to round, but usually consist of between 1 to 3 each of VF-1, VF-11, VF-1S, VF-17D, VF-17S, VF-19A, VF-22, Pheyos Valk, Ghost and one only of the Annabella Lasiodora Mobile Weapon. Survival mode is my favorite of the three games. 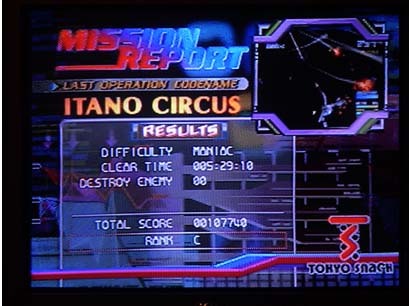 Itano Circus mode is probably the most boring of the three games in my opinion. 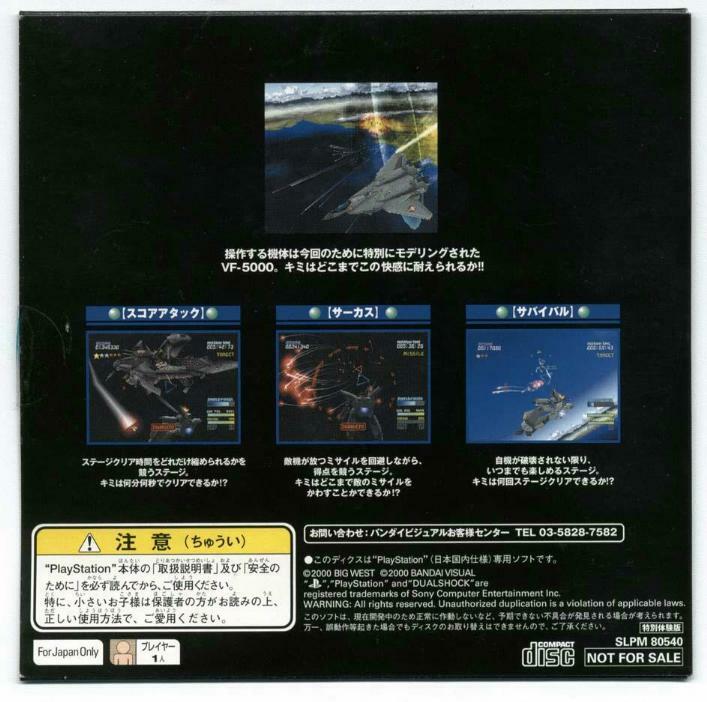 This is another space based game in which the player must dodge or shoot down wave after wave of missiles fired from an unseen drone which cannot be approached or destroyed. The aim of this game is just to survive for as long as possible. 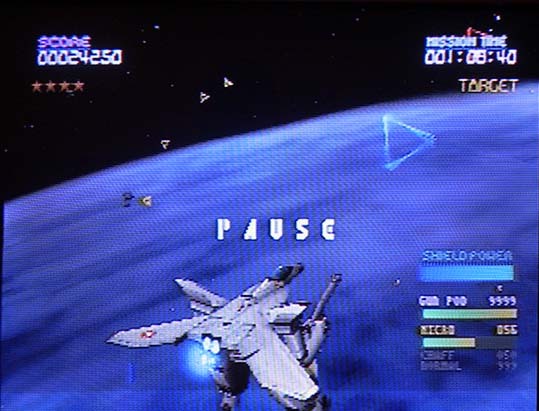 In Itano Circus mode the player is only armed with a gunpod. Also the number of missiles fired at the player gradually increases the longer you survive. This does lead to some impressive visuals after about ten minutes of play as the screen is literally filled with missiles. 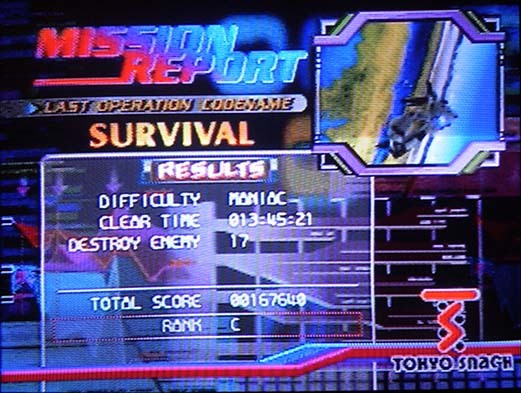 One neat feature of VF-X2 Special Version is the addition of a Kill Score as you are playing in either Survival Mode or Score Attack mode. 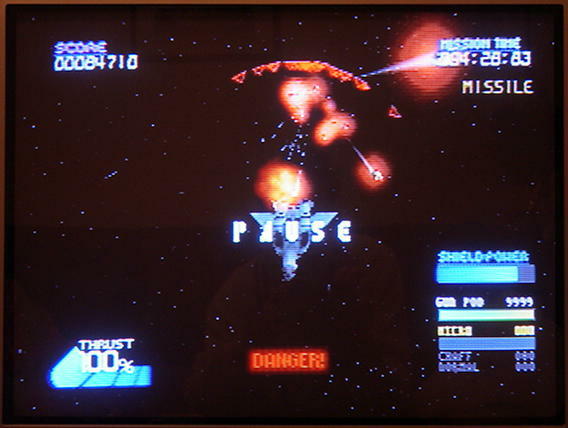 This Kill Score takes the form of different colored stars which appear in the top left corner of the screen each time the payer makes a kill. To start with each kill is awarded with one small red star. Each time the player achieves 10 kills, the 10 red stars change to one slightly larger silver star. If the player reaches 50 kills he is rewarded with one large gold star. My person best kill score on Survival Mode playing on Maniac difficulty is 47 kills so far! Although I can't confirm it, does seem to me as if it takes fewer hits to destroy the enemy in VF-X2 Special Version than in regular VF-X2.